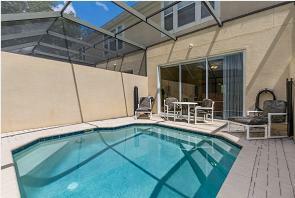 A Wonderful TownHouse Near DisneyWorld! 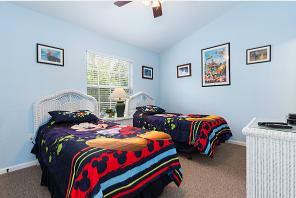 Enjoy your vacation in our 3 bedroom, 3 bath luxury townhouse that's only two miles from Disneyworld's maingate. 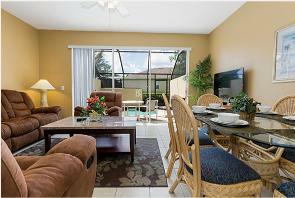 Located in the fabulous Windsor Hills Resort, this home is great for relaxing, playing, and keeping you near the action. You just can't go wrong! After a long day at the parks, soak in your very own private and screened-in splash pool (optional heating available). The pool faces SouthWest, offering plenty of sun. The Great Room is spacious and has a 46 inch LCD TV with cable, a DVD/CD player, and a separate dining area with seating for 6. The kitchen is fully equipped with refrigerator, stove, microwave and dishwasher. A washer and dryer are located on the second level. Dishware, utensils, and towels/linens are all provided. Be sure to take advantage of all that Windsor Hills Resort has to offer! A short walk to the luxurious clubhouse takes you to the Olympic-sized pool with dual water slides, and zero-depth entry for the kids. A 50 person theater shows movies daily, and you can get snacks and supplies at the sundry shop. Plus, your kids will love exploring the castle-themed playground. Access to all of this is free as a Windsor Hills guest.